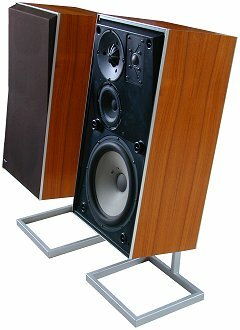 The largest of the S type Uniphase speakers, and a development of Beovox S 60. In common with the rest of the Uniphase range, Beovox S 75 had an angled resin front and a fine wooden cabinet. The rear panel was vinyl covered chipboard and a high quality wooden carcass. The removable grille was plastic in construction with pegs to fit in holes on the resin front and cut outs for the drive units. It was covered in black cloth. The speakers were identical with the drive units not being mirrored. Two dome units were fitted at the top of the speaker, the smaller being a 2.5cm and the second a 5cm unit fitted in its own cylindrical tube. The phase link unit was again fitted with its own cylinder in a similar way to Beovox S 45-2. On this occasion, the phase link unit was a 12.5cm unit. The woofer was interesting as instead of the normal Peerless unit, a high quality SEAS unit was present. Connection was made by the usual recessed 2 pin DIN plug on the rear. An optional stand was available and preferable as with a frequency response down to 36HZ shelf mounting could lead to an over emphasised bass. The S 75 had the later square stands. Text copyright © Beocentral. Unauthorised reproduction prohibited. Beovox S 75 was designed to be used with any of the Beomasters made at this time, and in particular Beomaster 4400 with its 75W output, this being the main reason for the replacement of the very similar Beovox S 60. Beovox S 75 was replaced by Beovox S 120 in the revised Uniphase range. Text copyright © Beocentral. Unauthorised reproduction prohibited.